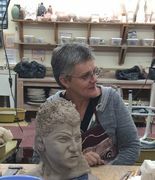 Discover how it feels to get your own hands into clay. The student will learn the basic on how to throw, center and shape clay. The basic cylinder that is created can be enhanced and embellished to add to your design. The last session of the class focuses on glazing. The techniques students will learn are hand positions for centering and practicing coordination of body and mind. What a great class to experience a unique art form. THE CLASS HAS LIMITED SPACE. Please register early! Be sure to wear clothes you do not mind getting clay and water on. In High School, she decided to take Art Classes as her main focus and then she went to college to become an Art teacher. At that time, we were exposed to a lot of different art disciplines: painting, ceramics, drawing, photography, sculpture, print making as well as scientific design. For her year-end project, she choose to focus on Print Making, a discipline she kept practicing through the early years of her married life. She graduated in Belgium as an Art teacher in 1983. When she arrived in the US in 2001, she found Chastain Art Center in Atlanta where she took wheel classes for 2 years. About that period, she got a full-time job at the Atlanta International School, her new professional life did not allow her to attend the day classes at Chastain anymore so she switched to the evening hand building clay classes. Luce taught the French language at the Atlanta International School in kindergarten and elementary for 15 years and retired in 2016.